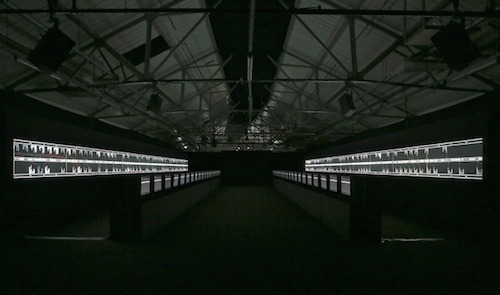 In a mesmerizing display of digital processing, the two components of Ryoji Ikeda’s installation Supersymmetry, 2014, transform this large blacked-out SoHo garage into a startling posthuman environment. Ikeda developed this work during a residency at CERN, alongside scientists who speculate that supersymmetry might explain what constitutes dark matter. In the work’s first component, [Experiment], clusters of ball bearings are rolled in swarms across three platforms, square boxes that continually tilt in different directions. Tracked by infrared sensors as visual data and sound, the movement of these objects generates disorientating strobe flashes and sharp, crackling noise. This data is simultaneously transmitted to the second component, [Experience], which includes pulsing screens and projections installed behind curtains toward the back of the space. The data is here used to program a mass of continually changing imagery and information that in turn produces an array of electronic sounds. Having a mechanical process produce such a enormous amount of digital data relates to CERN’s intention to prove that each known particle must have a partner yet to be discovered. The rapidly changing video and graphical data plays on facing rows of forty LCD screens and wall projections; there are six sequences that total some ten minutes. At the onset, barely audible beeps and clicks accompany the dry whoosh of sound as pulsing lights speed across the screens. Their sparse timbre and spatial ambiguity mark Ikeda’s sounds as unmistakably digital. The dry, rasping staccato, sine wave echo, computer vocalizations of garbled texts, and oscillating humming feel like the sound track to an incomprehensible non-Euclidean outer-space environment.